A week ago my hot water heater died without warning. Essentially, I was forced to live up to my homeowner’s responsibility of restoring life and the universe back to normal! Whenever you are troubleshooting, it’s always better to start with the cheapest and easiest repairs first. That way you don’t make the mistake of buying a brand new water heater when you could’ve fixed the old one for ten bucks! In this scenario, the cheapest and easiest fix was to take apart the burner assembly, clean it and attempt to relight the pilot. Unfortunately, that didn’t work so I did a little more research. All of the main symptoms (pilot lights, but won’t stay lit after release of the pilot button) were pointing to either the thermocouple or gas control valve, otherwise known as the thermostat. Since the free fix didn’t work I moved on to the next troubleshooting idea – replace the Thermocouple!!! Another let down. the cheap $10 replacement of the thermocouple was also a no go. At this point everything is now pointing to the gas control valve. Time to drain the tank and move on to the next item on the ol’ checklist. Upon further inspection and draining of the water heater, we discovered that the tank had 7 years of sediment build up. I think that’s what in all probability killed the gas control valve. The water draining out of the tank was also a slight rustic color, which could indicate that the water heater has some internal deterioration as well. Did you know you can do some basic maintenance to help prolong the life of your water heater by draining and flushing the water heater tank once a year? Neither did I! Neither did I. In retrospect, I probably could’ve fixed the old unit by installing a new gas control valve. Yet, how long would that last me before the tank rusted through and started leaking all over my garage? After some thoughtful considerations on whether to order a new gas control valve for $135 + $42 expedited shipping, I decided it would be best to “simply” replace the whole unit and actually perform the recommended maintenance going forward. 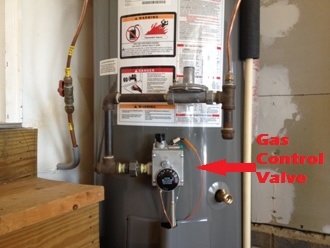 Technically, I was replacing a gas water heater using the existing set up and not installing one from scratch. That would be slightly more complicated! By the way, I should be clear that I knew absolutely nothing about hot water heaters prior to this one’s demise. You would be surprised how helpful Youtube can be on the subject of installing a gas water heater. Plus, I do have some mechanical ability from working on my own cars, and helping my Father with the many household projects he’s done over the years. This is my way of saying that I had a certain degree of confidence that I could do this install on my own. CAUTION: Since we’re dealing with gas here… there is a slight chance that you could blow yourself up. If you don’t feel like putting your ballz on the line, then it may be best to call in a pro! Consider that my disclaimer in case you accidentally incinerate the family jewels. By doing my own installation I think I saved $400-700 dollars or more in installation costs. I also learned a lot about water heaters, how they work and how to trouble shoot, remove and install them. The biggest downside was having to spend a week without hot water while trying to get it installed correctly and up to code. In addition, I gained a greater appreciation for the ability to have flowing hot water on tap… something billions of people must live without! All in all, I realize why plumbers charge so much to install these heavy beasts. In fact, after looking over the numbers I’ve been thinking that maybe we should go into the plumbing business!!!! We’re NOW open for business!!! … um, not really! On second thought, installing hot water heaters daily could wear a brother out and I’m not so sure I’d enjoy doing this for a living. Not that there’s anything intrinsically wrong with it. 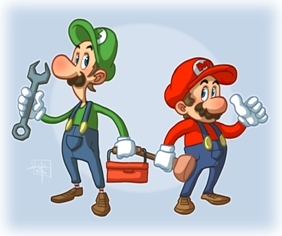 I definitely have a deeper respect for Mario and Luigi! Most importantly, the final lesson is that when the hot water is gone… someone’s gotta bring it back! Now you can either pay someone to do it for you or YOU can do it yourself. Yet in the end it is a job that has to be done. The question you need to ask yourself is…. to Save Several Hundred Dollars? Still Not Convinced You Should Do It Yourself? Now for those still unsure if it’s worth it, we’ve included a play-by-play recap of the entire process and time estimations that were spent on the job. Now be advised that this is NOT a “how to” article; I am just documenting the basic steps I went through for purely informational purposes. And to help you decide whether you want to tackle such a project. You may decide that your time is a valuable commodity and could be better spent on something else. That is definitely a viable argument and one I fully support. Even though I saved a decent chunk of cash, I paid for it with the opportunity cost… for all you inspiring economists out there! In other words, even though you might save several hundred dollars… you have to ask yourself what your time is worth? If you were to put those same hours into running your business or other money-making pursuit than the value of your time may well exceed the money you’d save. In this case, it would be more advantageous to simply call a plumber. Personally, I took this on as a homeowner challenge and a learning experience…. I’m glad I saved some money on the install, but as you will see, I definitely paid for it in time and labor putting in the new one. On the bright side, I learned quite a few things that will help me in the future should another unit ever fail or need installed. And next time, I am certain I could do it in about half of the time. In my opinion, it was definitely worth all of the trouble! Here’s the Full Recap of Our Water Heater Adventures!!!! – Took my last hot shower unknowingly or I would have savored the moment! – Called around to see where I could buy a direct vent water heater. – Took a HOT SHOWER!!!!!!! In Conclusion… Flow Like Hot Water My Friend! By the way, I’m still not finished. Got to fix the small leak, silicone the outside vent terminal, and will probably take the gas pipe connections apart and use pipe joint compound to seal them better. Also have to box up the wrong water heater and unneeded supplies and take them back to Lowe’s for a refund. Well, if you’ve read this far you are either really bored at work OR considering installing a gas water heater yourself! Either way, you are now armed with some insights on whether you should attempt this job or outsource it to someone else. Hopefully, this was helpful to you in some way. 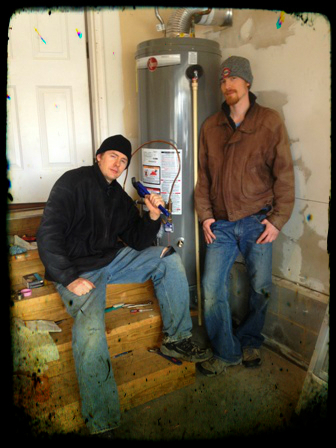 Thanks for reading our hot water heater adventure story! P.S. I want to send a big shot out and thank you to my brother, Cory for helping me with the installation process. No way, I could of done this without his help. Definitely a two man job! 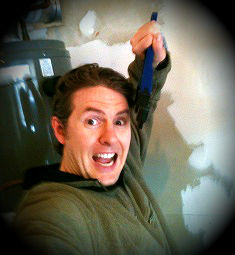 An awakened warrior should do a tutorial on painting that bare drywall garage !!! great article, thanks for your story! my water heater is leaking and beyond repair, and leaning towards installing new one myself. I have good experience and general knowledge (electrical engineer degree, decades of taking everything apart haha!) but it definitely helps the confidence knowing other people like me can install the water heater on their own. thanks again for taking the time to post your story. nice bikes! Hey Glenn! Sorry to hear about the leaking water heater my man. You can do it… just do your research and due diligence first. One thing that tripped us up was the venting system, so make sure you know what type of venting system your house is set up for. Youtube was a great help as well. Glad our story was of some value to you. Let us know how it all works out for ya. Thanks for the article. I was thinking the same thing until I found out my local hardware charges $175 for installation. I realize this post is now 4 years old, but I am having a similar situation and was wondering what hardware store you used? 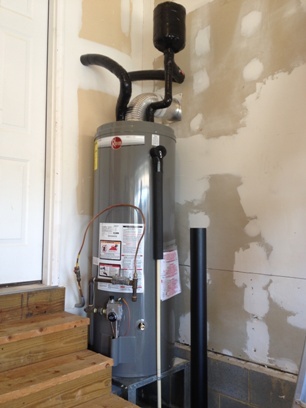 So my husband has decided to put the new gas water heater in by himself – I think its stupid. He says “Its so easy, just one gas pipe to attach and two water pipes and its so much cheaper” well when I think of it, what happens if all of a sudden there is a leak in the gas pipe? Everything could work great at the beginning and after a few days anything could start leaking (like gas) and you could die in the night while you sleep. I am would rather pay the price for a professional to install this thing. Its one thing to install water pipes and maybe have water flood your basement, but playing with gas is dangerous if you have no experience. I will rather pay the high price to make sure my family is save in our house.